We recently met with Sam Maggs, Project Coordinator for Gig Buddies Scotland. Gig Buddies Scotland is a not-for-profit project under the charitable organisation Thera Trust. It aims “to link music fans who have a learning disability with volunteers who share a common interest”. The project focuses on preventing social isolation through befriending. For Sam, flexibility at work means that he can be available to meet other’s needs. Sam works wherever he needs to be. That might be at home, in a coffee shop, at a conference event, at a gig, or at a volunteer’s home. The list goes on. Sam shows that with a flexible career you can achieve a huge level of freedom and availability while contributing to an important and meaningful cause. His ‘working anywhere’ brings people together. Can you tell me about your background? What led you into this line of work? I graduated university in 2016 with a degree in commercial music. Towards the end of my degree, I had to do a business project with another student. I did it with a guy who was not anti-establishment but anti-business, in a way. His dissertation was all about music in a non-commercial sense. We decided we wanted to do something not-for-profit. We wanted to do something that was music for music and not music for profit. We applied for a short-term grant that O2 was offering. They do a thing called ‘Think Big’, in which they give out small grants for use in short-term community projects. Once we obtained the grant, we ran a not-for-profit called ‘Sound of Mind Music’. This was a music workshop mostly for people with Dementia. Once my degree project ended, I came across this job in Edinburgh. What was the outcome of your project? It got us experience in dealing with people in support organisations. Additionally, this project gave us experience in working with a range of disabled people. Not everyone we were playing music to had Dementia. We went to a few residential homes where there were people with learning disabilities or acquired disabilities. This project wasn’t the only time I’ve been around disabled individuals. In fact, my dad is a care manager for people with learning disabilities. I didn’t have any anxieties over this line of work as I had been brought up around people with additional support needs. This is something I’ve been used to since I was a child. I work for Thera Scotland which is an organisation subsidiary within Thera Trust. Thera Trust is a registered charity which works across the UK. They support people with learning disabilities. Where does Gig Buddies come into it? We are a not-for-profit project within Thera Scotland. How did Gig Buddies come about? Gig Buddies was formed 5 years ago in Brighton by a punk band called Heavy Load. Many people within the band had learning disabilities. They played at gigs until the early hours of the morning but they noticed that a lot of their fans and friends with learning disabilities left the gigs early. Ultimately, it was because of inflexible support in social care. Paul Richards, a bass player in Heavy Load, co-founded Stay Up Late (SUL) in response to this. SUL is an organisation which campaigns for disability rights. Gig Buddies was set up by SUL in 2013. They licensed this product [Gig Buddies] out to different organisations. Thera Scotland has a licence to run Gig Buddies. What do Gig Buddies do? 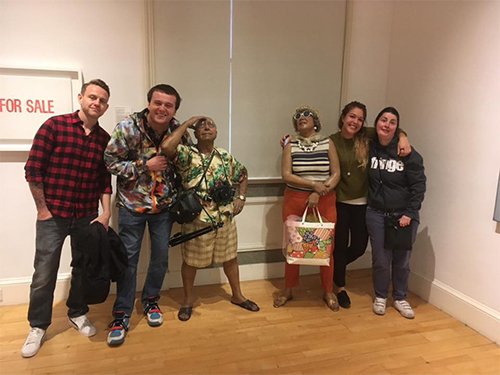 Gig Buddies aim to prevent social isolation by pairing people who have a learning disability with a volunteer who shares the same interests in music and theatre, for example. Once a month, each pairing goes out together and has a good time. Why are volunteers sometimes needed? A disabled individual can be the best of friends with their support worker. Yet, ultimately, their support worker is paid to be in their lives. The support worker could say that they can’t spend time with them over the weekend because they’re not on shift then. How has Gig Buddies been proven to benefit individuals with disabilities? Being happy has been proven to make you a healthier person. People need and want social lives. Being deprived of that can actually be very unhealthy. Gig Buddies helps to enhance their social lives and give them a choice in what they do. What is your role within Gig Buddies? I am the Project Coordinator for Gig Buddies in Scotland. I am the only person who develops and manages the Gig Buddies project in Scotland. My role involves recruiting, training, and supervising a team of volunteers. How much flexibility does your career have? It is pretty flexible. I work 39 hours a week. I don’t have set shift hours or a set working location. My job isn’t just flexible in terms of location and time. It’s about being flexible around other people and the needs of these people. My contract basically says I am always on call. I constantly have my work phone on me if anyone wants to get a hold of me. The volunteers and people we support also have full-time jobs, so I have to work around that. What words would you associate with flexible working? Working when I need to and where I need to. It’s also about availability for clients. Are you happy with the level of flexibility that you have? The only one downside is that we don’t have a place, a Gig Buddies office, for volunteers and staff to meet. I think that having a building might give people more confidence in the project. What is your typical working space throughout the week? Throughout the week, the bulk of my work is done at home. At home, I organise materials for volunteers and I email a lot of people. I am out and about quite a lot too. For example, tomorrow I have a leadership meeting tomorrow out at Dalkeith. I also have a meeting about a pairing that evening. On Wednesday, I am at West Lothian. There, I’m meeting with some organisations including the West Lothian Council. On Thursday, I am in Glasgow. There, Gig Buddies are running a conference event and a gig in the evening. At the end of the day, it’s about working in the community and being wherever I need to be. What does your ideal working space look like? 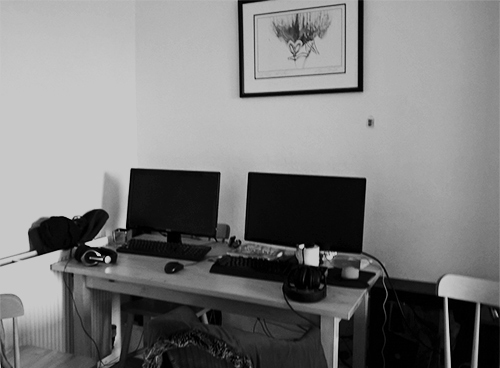 My ideal working space would be in the style of Pixar, Google, or Facebook. These spaces are all really open plan and extremely freeform. A space like that would be useful when I am working on a project on my own. A lot of the time, when you’re working on your own, you’re without support. Obviously, people are just on the other end of the phone for me, but they might not always be available. It would be nice to have a space where there are other people to talk to and get advice from. What would you consider your goals to be for the future of this project? To expand the project into other areas of Scotland. At the moment, we support people in Edinburgh, Midlothian and West Lothian. What do you hope to get out of your career? I don’t want Gig Buddies to be seen as a social care project, more of a social change project. I want to get people to think about learning disabilities differently; to be more open-minded. I want to phase this different way of thinking into the music industry with the gigs we are running. I strive to give people a voice within their music community. 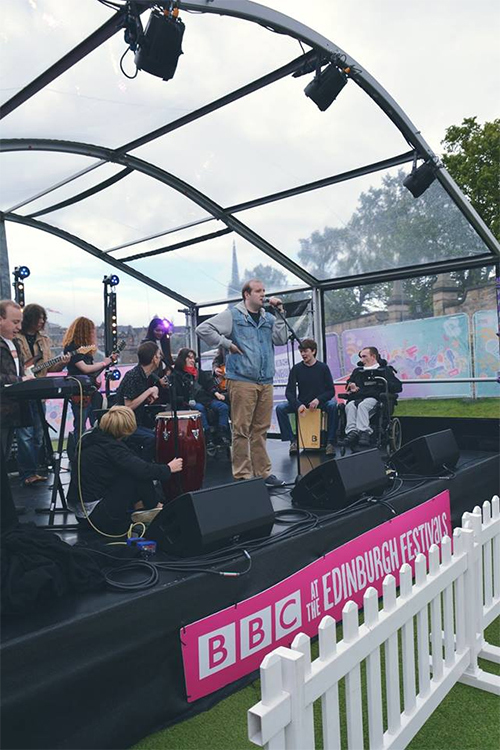 I also hope to help give disabled music artists a voice through the gigs they’re doing. So not only pairing people together but creating greater awareness of different disabilities? Yes. There is a huge discussion around what a disability is and what accessibility is. We aim to educate people about this. Many venues are apprehensive about running a night for those with learning disabilities. Some might not have even thought about this or done this. Accessibility doesn’t just mean letting wheelchair users in. There’s so much more to be done in terms of making places accessible. It’s about what your venue or business looks like facing the public. It’s also how you actively welcome people with a learning disability. Do you have any respected professionals or famous figures that inspire you and if so why? David Bowie, in the sense that he constantly challenged what people expected of him. Gig Buddies also aim to challenge the public’s expectations. Their expectations of what people with learning disabilities can do and what they are able to do. – Accessibility is a vital part of any business. It’s about ensuring everyone can enjoy places, products, services, people and information. – A flexible career can make you more available to those who need you. – It can be difficult to get people’s advice when working remotely. How to work anywhere How can flexible working help you attract, engage, and retain millennials?